A short video clip of Bernard Katz glass blowing shaping a hot glass sculpture on a marver table. The video clip shows Bernard Katz marving hot glass on the marver table to chill and shape areas of the glass piece in progress. The thick steel table is called a “marver”. A marver table is an essential piece of equipment in any glass studio. The cold steel table pulls heat from the hot glass. 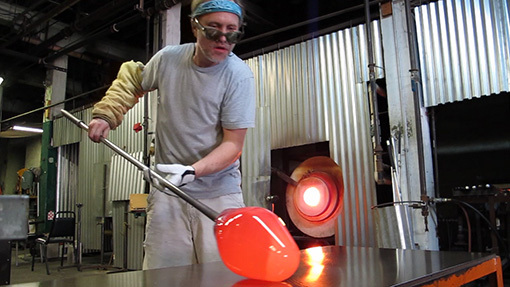 This allows the glass blower to chill certain areas of a glass piece while shaping the form. You can see Bernard’ s finger tips rolling the blow pipe to shape the glass form. This rolling motion needs to be very smooth and consistent, otherwise flat spots may be created.